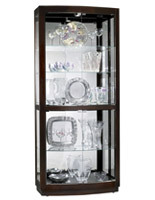 This Display Cabinet Features Interior Halogen Lighting and Background Mirror! 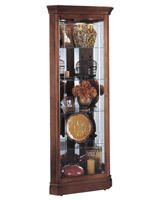 This Display Cabinet Is a Showcase with a Locking Glass Sliding Door and Cherry Wood Frame! 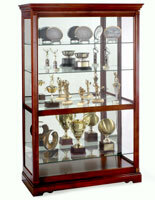 This Display Cabinet Are Shipped by the Thousands from Our Warehouse! 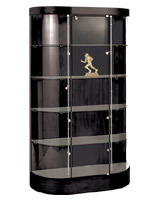 A No-Reach™ Touch-Lite™ located on the wood cabinet back to provide easy access to lighting. 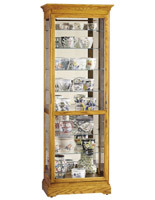 Fully adjustable glass shelving with Pad-Lock™ cushioned metal shelf clips give added stability. 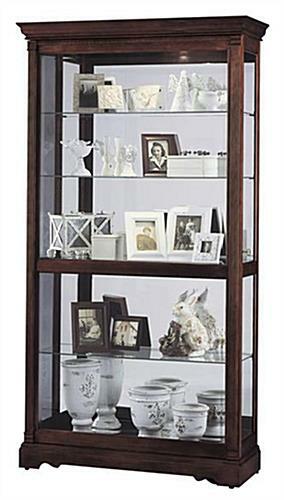 Interior halogen top-lighting for a whiter, brighter, more natural looking way to showcase your items. 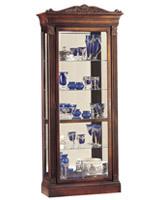 A stunning Windsor Cherry wood finish. 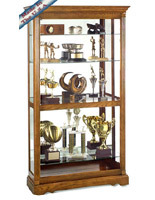 This display cabinet is ideal for exhibiting your most prized collectibles, trophies, or other articles. 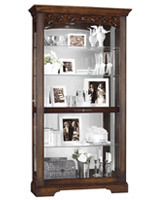 A wood scalloped bottom presentation with fine, detailed wood molding furnishes an elegant look.